I bought a Bonsai Tree about a year ago and have been watering it twice a week. Its a very large tree about half a meter tall. It stays in my living room and has been doing really well, however, it has started loosing a lot of leaves. They are not turning yellow or brown, they're still green and look fairly healthy but are still falling off the tree. Can someone explain what's wrong?? It's lost about a 3rd of it's leaves in just 2 weeks! Re: New Leaves are Falling off my Bonsai?? Malik wrote: I bought a Bonsai Tree about a year ago and have been watering it twice a week. Its a very large tree about half a meter tall. It stays in my living room and has been doing really well, however, it has started loosing a lot of leaves. They are not turning yellow or brown, they're still green and look fairly healthy but are still falling off the tree. Can someone explain what's wrong?? It's lost about a 3rd of it's leaves in just 2 weeks! I'd be willing to bet dollars to donuts it's a ficus/fig... and that in the last couple weeks it was allowed to get too cold. Ficus will blast perfectly green leaves if they experiance a sudden cold. It can be difficult to nurse them out of it... good lighting, warmth and humidity are your friends in this task. Don't over water since there is less need for water with a reduced foliar mass. If the cold was too long, the tree may be dieing, and there's little to be done for it. Ficus is very temperature sensitive. If the tree is just shedding leaves in response to cold, you'll see small leaves start to come back in a few weeks of proper nursing... generally located at the same site as the dropped leaves. Bonsai's require occasional re-potting and other treatment for maximum results. Take lots of pictures so we can help diagnose the problem! If it's a ficus, it could be dropping leaves just from any change in environment. Ours drops leaves twice a year.....once when we bring it in from outside in the fall and again when we take it out in the spring. If you've moved it recently that's probably the reason for the leaf shedding and is not serious at all. If it's due, as Victrinia says, to a sudden or prolonged chill it can be potentially lethal for the tree depending on the length of exposure. It's funny but our Ficus trees can be left outside in the fall to experience the cooler temps. as they occur with little problem (as long as the temps. are within reason), but the suddenness of a chill when they are not used to it can shock them. I have not repotted or pruned the tree since i bought it, but the advice i was given was that it probably wouldn't need it just yet as i only had it a short while. I don't tend to water on schedule, usually when i feel that the soil is very dry which is usually twice a week. Through the summer months i was feeding it with Bonsai feed once week, and recently I've been doing this ever 2 weeks. I've taken a couple of pics, just need to work out how to post them? 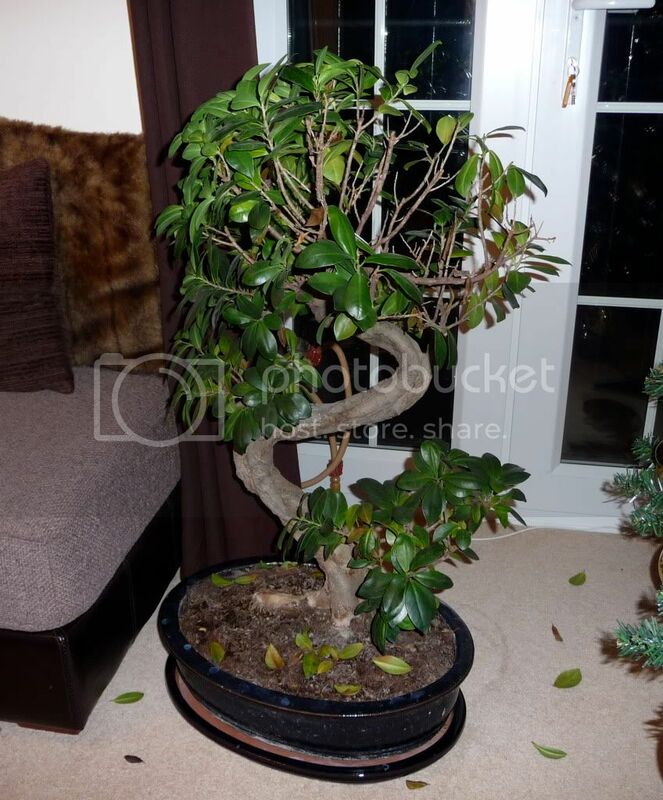 Malik wrote: I have not repotted or pruned the tree since i bought it, but the advice i was given was that it probably wouldn't need it just yet as i only had it a short while. I don't tend to water on schedule, usually when i feel that the soil is very dry which is usually twice a week. Through the summer months i was feeding it with Bonsai feed once week, and recently I've been doing this ever 2 weeks. You must first upload your photos to a image hosting website such as imageshack.com or photobucket.com. Once uploaded copy the img code (it will have the similar symbols as below) and paste the code directly into the text. Last edited by Malik on Tue Dec 22, 2009 6:18 pm, edited 1 time in total. Looks like a ficus. Your keeping it near a door with a draft by the looks of it. The leaf loss on the tree looks more concentrated on the tree region near the door. Last edited by maveriiick on Tue Dec 22, 2009 7:02 pm, edited 1 time in total. It is by a door but it's a double glazed door and lets no draft through at all. Malik wrote: It is by a door but it's a double glazed door and lets no draft through at all. I'd recommend moving it regardless (has this tree thrived before at this location during the winter time?) and take it out of the pot and look at the roots for pests or to see if it has become rootbound by chance. Last edited by maveriiick on Tue Dec 22, 2009 7:00 pm, edited 1 time in total. I have re-potted the tree now, there was no sign of pests nor had it become rootbound. I'm hoping in this case it's just a case of change in climate. Although I hadn't moved its location as it always stays in doors. As Maveriiick advised, i have taken it away from the door. I hope this does the trick.